I will now state from what types the signs are drawn, and this is the complete number. The physiognomist draws his data from movements, shapes and colours, and from habits as appearing in the face, from the growth of hair, from the smoothness of the skin, from voice, from the condition of the flesh, from parts of the body, and from the general character of the body. Aristotle’s Physiognomics survived into the Middle Ages via translation into Latin. The science became popularized in the 15th century due to a number of manuals on the subject, notably one written by the physician Michele Savonarola, grandfather of the firebrand Florentine monk Girolamo. Evidence of its popularity can be seen throughout medieval culture; Chaucer’s Canterbury Tales is just one example of the use of physiognomic theory in literature. Painted a year before Bosch’s death, “Christ Carrying the Cross” is practically a manual in itself of physiognomic principles. A flat plane confronts the viewer. The only landscape is that of human faces emerging from the dark. A total of 19 faces populate the panel – from Simon of Cyrene’s foreshortened upturned face to Jesus’ resigned, sorrowful yet serene face, to a diverse crowd of faces twisted in agony or rage — each one is a study in character and emotion. It was well established in medieval culture that beauty correlated with a pure soul; physical ugliness equated to sinfulness, moral depravity and deviance. 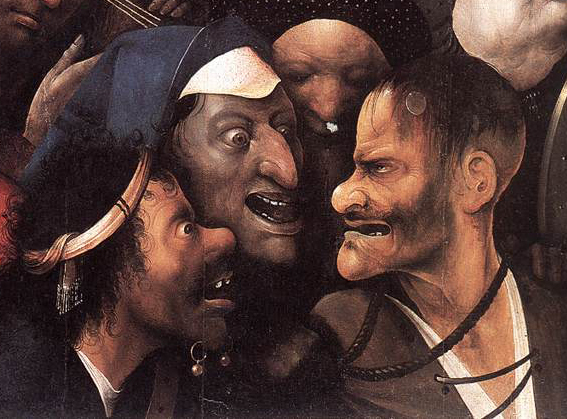 Clearly, the ideology of physiognomy in medieval Western Europe is fraught with problems for a 21st century viewer. In many of those tenets we can recognize the negative characteristics assigned to ethnic or racial types. Physical infirmity is also perceived in a negative light. Although this is offensive to our modern sensibility, we owe it to ourselves to see the painting within the context of its time and place. In the Middle Ages in Europe much of the world was distant and unknown, certainly to the average person. Anything foreign (derived from the Latin word foras, meaning outside) was at once exotic and frightening. Looking deeper into physiognomic rules, a long, hooked nose indicated maliciousness, deceit, and lust. A sharp jaw showed the person to be aggressive and cruel. Swollen facial features were a sign of gluttony. A wide nose was evidence of lechery, and thick lips of “serious intellectual deviancy, harshness, and defective reasoning”. Other physical indications of wickedness included defective eyes, wrinkles and imperfect skin and disorderly hair. Lavish accessories (piercings, jewelry and headgear) contributed to an assessment of a bad character, as did exaggerated gestures and extreme facial expressions. All of these features and character flaws appear in the hideous faces of the roiling crowd that engulfs Jesus as he makes his way to Calvary. The face of Jesus, on the other hand, with its straight nose, balanced features and blemish-free complexion declares him to be the apotheosis of good. As I try to decipher the painting, the emotional complexity of the faces frustrates my understanding. 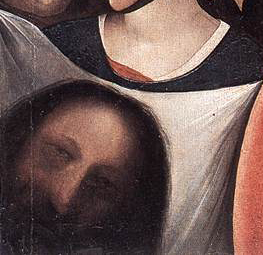 The entry into the painting occurs in the lower left corner, where the face of Jesus gazes out at the viewer. Interestingly, this is the only face that isn’t actually a face; it is the impression of Jesus’ face on St. Veronica’s veil. 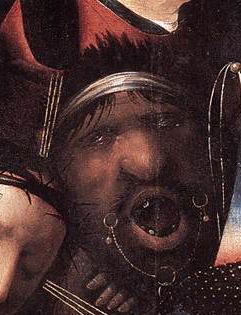 In addition, this is the only face in the painting that confronts us directly, gazing out of the picture plane. The confrontational gaze seems an exhortation to make a choice: join the wicked rabble or follow me. A swirling throng of grotesques overwhelms the composition. It is a noisy crowd, and the closeness of the figures creates a nightmarish claustrophobia. Groups of characters interact, such as the men surrounding the bad thief in the foreground, who taunt him as he snarls. Or do they greedily devour the tales of his crimes as he unrepentantly recounts them? The bad thief is the baddest of the bad, and is proud of it. The unkempt hair, sharp facial features and dark complexions of these three sinners emphasize their intense expressions and their evil nature. A tonsured monk in the top right corner pontificates to his captive audience, the good thief. The monk’s hideousness indicates a strong indictment of the clergy; he looks as wicked as the rest. There seems to be no relief for the repentant thief, whose eyes roll up in his head; with his grey skin and mortified expression he is half-dead already. Their companion, variously described as a physician or a Pharisee, observes this interaction with his ghastly hook-nosed profile (most certainly an anti-Semitic depiction). The sharpness of his profile creates an ugly negative space adjacent to it. A few of the figures don’t need to interact to show their perversity. The Roman soldier leading the procession is a study in determined aggression. His swollen facial features remind us that he is gluttonous and cruel. The dark brute of a figure just behind the head of Jesus howls in beastly hatred, to add to the cacophony of the crowd, or just to hear the sound of his own voice. Physiognomic texts from Aristotle forward rely on the comparison of human faces to certain animals, and what the characteristics of the particular animal reveal about its human lookalike. This bullish figure is a prime example of that philosophy. 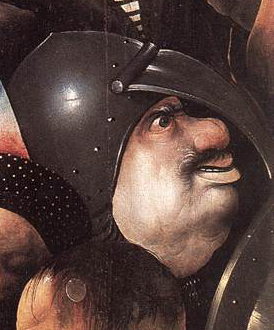 Although a product of the late middle ages, Bosch lived on the cusp of the Renaissance. I need to remind myself that Bosch and Leonardo da Vinci were almost exact contemporaries (Bosch 1450-1516; da Vinci 1452-1519). As such, this painting not only displays the entrenched thinking of the Quattrocento, but also the modern, individualistic philosophy of the early Renaissance. Leonardo criticized the science of physiognomy, but made use of it anyway; he even intended to create a manual of physical types for the benefit of his students. He made many drawings of facial expressions and facial types, the most widely known being his “Five Grotesque Heads” from 1494, copies of which were disseminated throughout Europe. Da Vinci advocated a more “naturalistic” portraiture, evident in the drawing. I suspect Bosch saw the drawing or at least a copy of it, and that it inspired the variety and specificity of the faces in his painting. 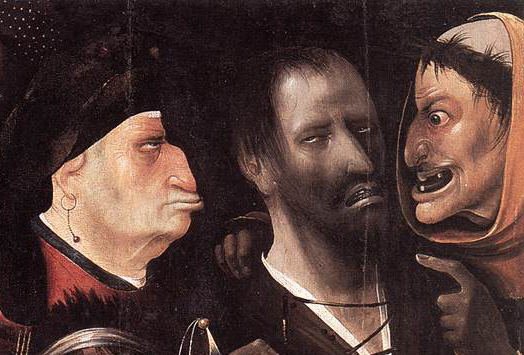 The most enigmatic figure in “Christ Carrying the Cross” is the one lurking behind the bad thief’s group. At first glance (admitting to my 21st century, post-Harry Potter bias) he looks like a wizard. His eyes are downcast like Jesus’ eyes as he bears the cross, and like St. Veronica’s as she quietly exits the scene. From that perspective he would seem to be a positive symbol. He has the white beard of the sage, barely visible in the shadows, his features are balanced, his mouth is closed, and he wears a conical hat. The hat itself seems to give a glimpse of the glory of the heavens, the cone pointing up and decorated with a gradated sky, its brim decorated with stars. But the cone itself creates an oddly flat triangular shape. As I examine it, it flip-flops: now it is a hat, now it is a slice of light glimmering from behind the panel. Although the wearer of the hat seems relatively serene, I know that the key to this figure is not so easily found. The conical hat has a multifarious history, having been worn in just about every society in the world. Is this the conical hat of public shaming (a precursor to the 19th century “dunce cap”), the conical hat of the sorcerer with forbidden knowledge, or the “Judenhut” that Jews of the Middle Ages were forced to wear to identify themselves as infidels? Or is it a metaphor for the spiritual choice Jesus urges us to make? With this ambiguous figure Bosch seems to suggest that there is a path to redemption: just as the alchemist seeks to transform lead into gold, we can choose to transform our sinful nature through faith. This year is the 500th anniversary of Bosch’s death. In celebration a number of exhibitions and events are taking place. A major exhibition of Bosch’s work has just closed at the Noordbrabants Museum in ‘s-Hertogenbosch (Bosch’s birthplace). ‘s-Hertogenbosch is also the site of many other Bosch-related exhibitions and events this summer. In addition, the Prado Museum opens “Bosch: The 5th Centenary Exhibition” on May 31. It runs through September 11. Too fragile to travel, “Christ Carrying the Cross” resides in the Museum of Fine Arts, Ghent. *There are opposing opinions as to the authorship of “Christ Carrying the Cross”. 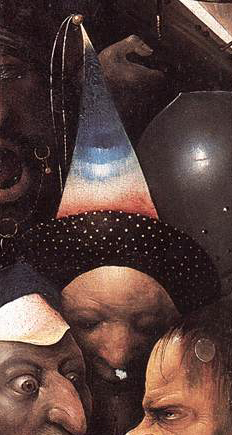 The subject of a conference in 2015, the painting was technically and stylistically analyzed by the Bosch Conservation and Research Project and the Museum of Fine Arts (Ghent). No consensus was reached. While the BCRP contends that it cannot be the work of Bosch, the Museum continues to consider it an important part of Bosch’s oeuvre, and as such, intends to leave the wall labeling and identification intact. For simplicity’s sake I will assume that it is a Bosch, and that it dates from 1515.